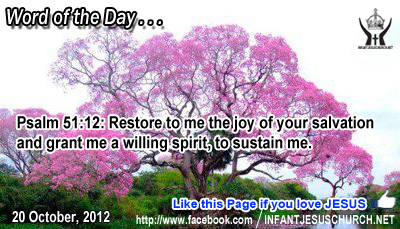 Psalm 51:12: Restore to me the joy of your salvation and grant me a willing spirit, to sustain me. Heavenly Father, we long for the outburst of joy in your salvation like we see in the book of Acts. We pray for your Spirit to lead us into one more era of outreach, conversion, and festivity. We pray for wisdom to know and for eyes to see those approximately me who are most open to the Gospel. We want to be a partner with you in your continuing work of salvation. In Infant Jesus' name we pray. Amen. John evangelist says to us that "God so loved the world that he gave his only Son, that whoever believes in him ought to not perish but have eternal life. Jesus' death on the cross triumph for us our salv_ation and acceptance as the children of God. The love and mercy of Jesus Christ, the pardon of sins, and the gift of the Holy Spirit are liberally given to those who acknowledge Jesus as their Lord and r_edeemer. Is our hope securely placed in Christ and his victory on the cross? Loving Infant Jesus, you are our hope and salvation. May we trust you at all times and rely on your grace in times of testing and temptation. Let the fire of your Holy Spirit burn in our heart and fill with a consuming love for you..